We set up our own CNC Engraving and Vinyl Printing department because we couldn't obtain the required levels of service, consistency and value from existing suppliers to service the control panels we were building. As ICA is also a control systems manufacturer we understand the needs of other panel building companies and Word got around and we started doing engraving and printing work for others in the industry. Using 'state of the art' CNC equipment we engrave and route a range of materials from plastics, wood and brass to stainless steel, or on customer supplied materials. 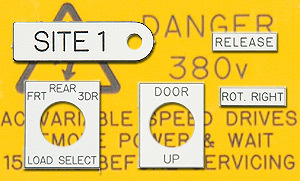 All work is carried out to a very high standard and to BS EN ISO 9001. Designs and layouts can be provided in house or supplied by the customer in various formats including sketches, CAD drawings, scanned images, and a multitude of different PC files to incorporate company logo's and complex images. 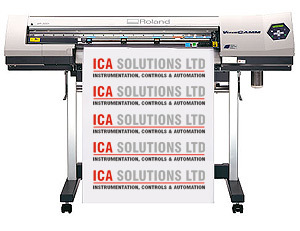 Our Roland VersaCAMM SP-300i printer delivers a high quality image (1440 x 720 dpi resolution) and together with precision contour cutting, it's ideal for the production of labels and stickers and other applications where complex design and shapes are required. In addition to the CNC engraving and Vinyl Printing, there's another type of label that we and others in our industry use and that is produced with a thermal transfer printer. 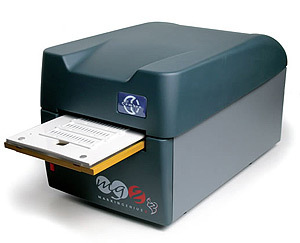 Our Cembre MARKINGENIUS2 is a high resolution, thermal transfer printer developed exclusively by Cembre to produce high quality print on markers, legends and labels for the identification of conductors, electrical components and equipment.